About Tenerife - Tenerife Property Shop S.L. Tenerife continues to attract more people every year; some people will be experiencing the island for the first time, but a remarkably high percentage will return again and again. More people return to Tenerife that any other tourist destination in Europe . So what is it that makes people fall in love with and remain enchanted by the island, year after year? Time takes on a different meaning in Tenerife where the climate and the scenery are wonderfully conducive to slow movement, long siestas, good company, making new friends and spending hours sitting quietly talking over a cool drink. But beyond Tenerife’s restaurants, bars and cafes, there is so much more to discover about the island. Tenerife, the largest of the seven Canary Islands and is situated in the centre of the island chain, between Gran Canaria, La Gomera and La Palma. The island is just over 300 km from the African coast, and about 1,300 km from the Spanish Mainland. Tenerife has an area of 2,034 km2 , crowned by the majestic Pico del Teide rising up in the centre to 3,718 metres, making it the highest point in all of Spain. Tenerife is a volcanic island that was originally formed seven million years ago when the areas of Teno, Anaga and Adeje emerged from the sea. In the centre of the island, the impressive cone of Teide (3,718 m) rises up over the Caldera de Las Cañadas, forming the highest point of the island and, indeed, of the whole of Spain. The rugged island terrain and the variety of climates has produced a territory of many different landscapes and forms, from the Teide National Park to the spectacular Los Gigantes Cliffs with their sheer stone walls. Arid, desert-like areas can be found in the south, valleys of tropical and sub-tropical plants in the North, areas of laurel forests in the Anaga and Teno massifs and large areas of pine forest above the laurel forests, left from the Tertiary Age. The wide variety of climates and landscapes in Tenerife is matched by a wealth of ecosystems, each with its own characteristic flora and fauna. The growth of the tourist centres and cities has gradually transformed the landscape, but without hiding the charm of the island and its inhabitants. Tourism leaves its mark in the resorts along the coast, such as Playa de las Americas and Los Cristianos, and there is a more traditional atmosphere in the north and a more cosmopolitan air in the south. Along with the archaeological sites of its Guanche past, the island conserves its own important historical-artistic heritage. Traditional and popular architectural style can be seen in the stately homes, farms and places or worship, but also in simple, rural houses, with their red-tiled roofs. The most representative elements of Canary Island style include the balcony, enhancing the façade and highlighting inner courtyards. The historic centres of La Laguna, former capital of the island, La Orotava, Garachico, Puerto de la Cruz and Icod de los Vinos are well worth a visit, whereas interesting hamlets can be found all over the Anaga and Teno massifs and the foothills of the south. The high number of endemic species of flora and fauna make the natural environment of Tenerife surprising, but there is also an enormous diversity of landscapes. 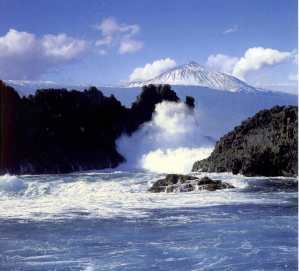 43 of the sites of natural interest on the island are protected natural areas, the best of which are the Teide National Park, surrounded by the Corona Forestal Nature Park, and the Anaga and Teno Rural Parks. Over 40% of the surface area of the island is protected in one way or another.